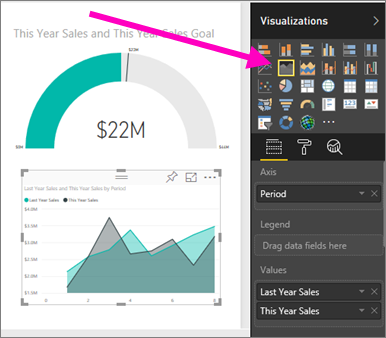 You've read Reports in Power BI and now you want to create your own. 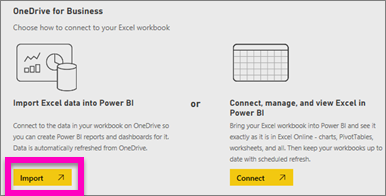 There are many different ways to create a report, and in this article we'll start by creating a very basic report from an Excel dataset using Power BI service. Once you understand the basics of creating a report, the Next steps at the bottom will direct you to more-advanced report topics. This method of creating a report starts with a dataset and a blank report canvas. To follow along, download the Retail Analysis sample Excel dataset and save it to OneDrive for Business (preferred) or locally. 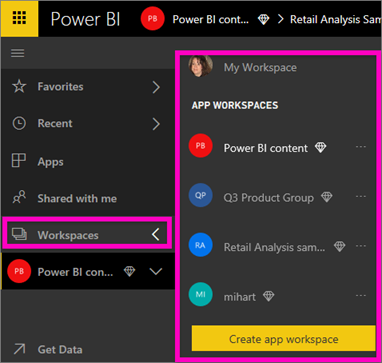 We'll create the report in a Power BI service workspace, so select an existing workspace or create a new one. From the bottom of the left navpane, select Get data. Select Files and navigate to the location where you saved the Retail Analysis sample. Once the dataset is imported, select View dataset. Viewing a dataset actually opens the report editor. You'll see a blank canvas and the report editing tools. TIP: If you're unfamiliar with the report editing canvas, or need a refresher, Take a tour of the report editor before continuing. Now that our dataset is imported, let's start answering some questions. Our Chief Marketing Officer (CMO) wants to know how close we are to meeting this year's sales goals. A Gauge is a good visualization choice for displaying this type of information. 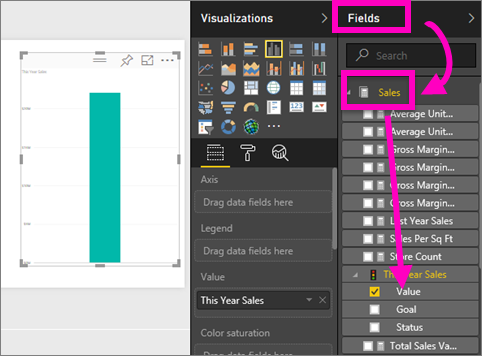 In the Fields pane, select Sales > This Year Sales > Value. 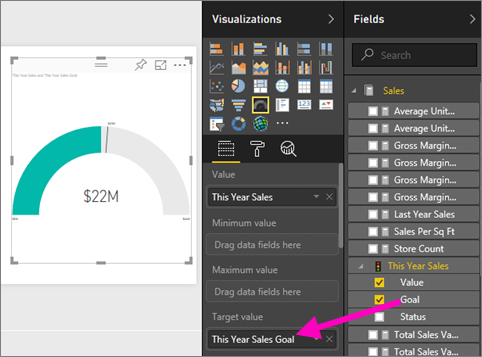 Convert the visual to a Gauge by selecting the Gauge template from the Visualizations pane. Drag Sales > This Year Sales > Goal to the Target value well. Looks like we're very close to our goal. 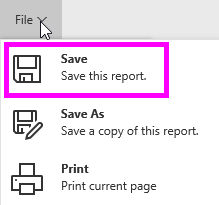 Now would be a good time to save your report. Our CMO has some additional questions for us to answer. She'd like to know how sales this year compare to last year. And, she'd like to see the findings by district. First, let's make some room on our canvas. Select the Gauge and move it into the top-right corner. Then grab and drag one of the corners and make it smaller. Deselect the gauge. 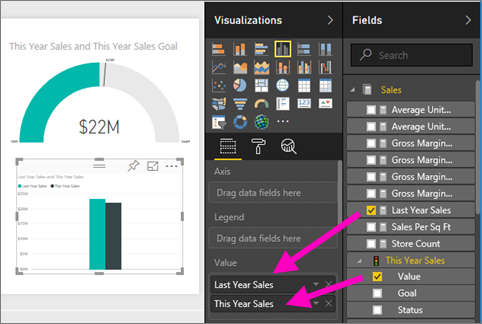 In the Fields pane, select Sales > This Year Sales > Value and select Sales > Last Year Sales. 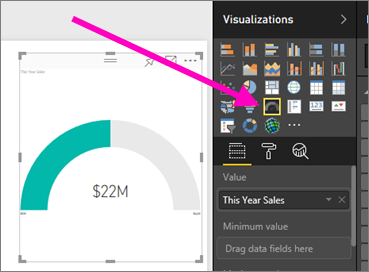 Convert the visual to an Area chart by selecting the Area chart template from the Visualizations pane. Select Time > Period to add it to the Axis well. To sort the visualization by time period, select the ellipses and choose Sort by Period. Now let's add the slicer. 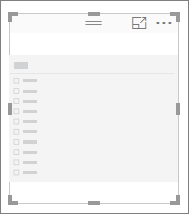 Select an empty area on the canvas and choose the Slicer template. This adds an empty slicer to our canvas. From the Fields pane, select District > District. Move and resize the slicer. 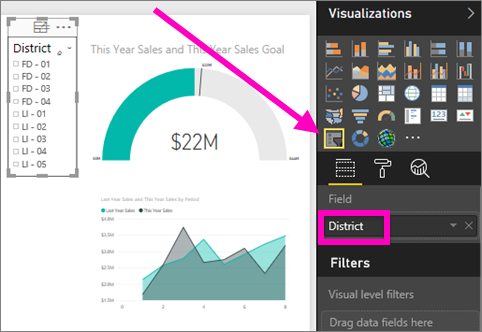 Use the slicer to look for patterns and insights by District. Continue exploring your data and adding visualizations. When you find especially interesting insights, pin them to a dashboard.